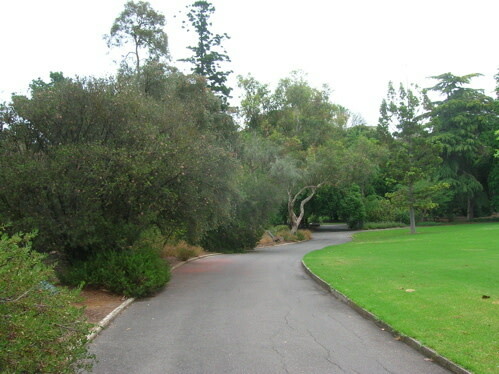 Like most Australian cities, Adelaide has several botanical gardens dotted around the city. I visited two during my short visit to that city. 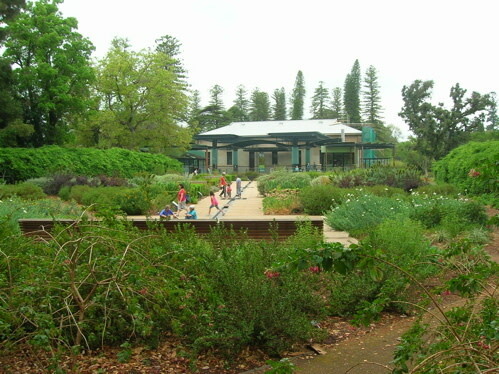 The larger one was the Adelaide Botanic Garden. 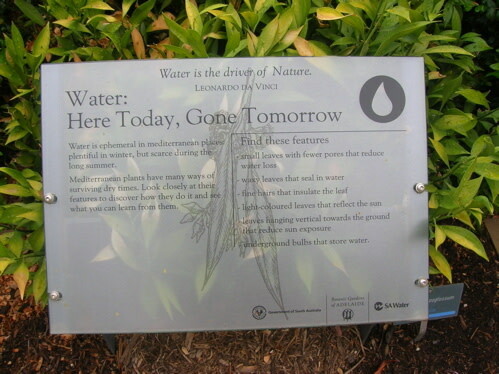 Situated on the dry Adelaide Plains, the Adelaide Botanic Garden includes a few native Australian "bush" and temperate rainforest habitats, sweeping lawns and mature, exotic subtropical trees and shrubs as well as specialty plant collections like cycads, palms and bromeliads. There is also a National Rose Trial ground where roses are trialed for their suitability to Australian gardens. There is a newly designed and planted terrestrial bromeliad collection, arranged in an elegant array of beds surrounding the Amazon Waterlily Pavilion. I visited the day after a prolonged heat wave with high temperatures of about 115 F. Some of the bromeliads’ leaves were a little fried but most of them still looked great. 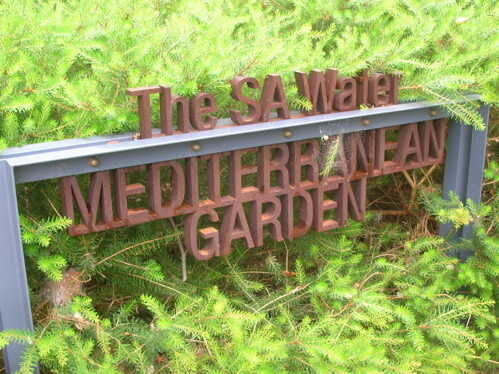 One of the most interesting educational areas of the garden was the South Australia Water Mediterranean Garden, showcasing plants from the five main mediterranean climates of the world: southwestern Australia, South Africa, Central Chile, California, and the Mediterranean Basin. Situated in southwestern Australia, Adelaide fits neatly into one of the five mediterranean climates of the world, with a classic mediterranean weather pattern of cool, wet winters and warm, dry summers. Portland (USDA Zone 8b), on the other hand, is considered a "modified mediterranean" climate. While we have the requisite cool, wet winter and warm, dry summer pattern, our cool, wet period is longer than in the classic mediterranean climate and our warm, dry period is shorter. Extreme highs and lows are mostly moderated by the maritime influence. And continental air sometimes floods the region via the Columbia River Gorge leading to occasional heat waves in summer and wind and ice storms in winter. 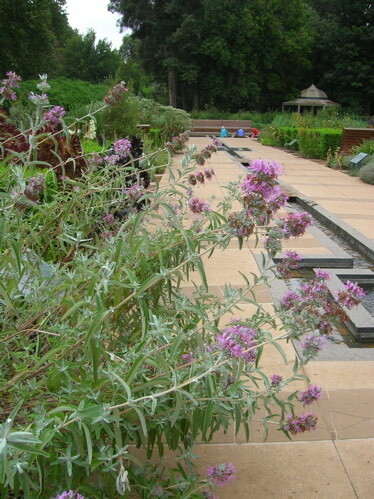 The Adelaide mediterranean demo garden offers plenty of ideas and inspiration for sustainable and climatically appropriate plants for Portland. Of course there’s much to learn about plants summer drought tolerance from seeing them grow in dry, lowland Australian conditions. But to do well in the Portland area, plants must also survive our wet winters punctuated by cold spells and occasional freezing winds. Some suitably water-wise – and cold-hardy – plants I glimpsed in my walk through the demo garden include: Grevillea juniperina from Australia; from South Africa, the silvery ground cover Dymondia margaretae and striking blue and white flowered Agapanthus; from Chile, a spiny bromeliad called Fascicularia (there were a few species, both hardy and not); Arctostaphylos (several) and Matilija poppy (Rhomnea coulteri) from California; and Myrtus communis and lavender cotton (Santolina) from the Mediterranean Basin. 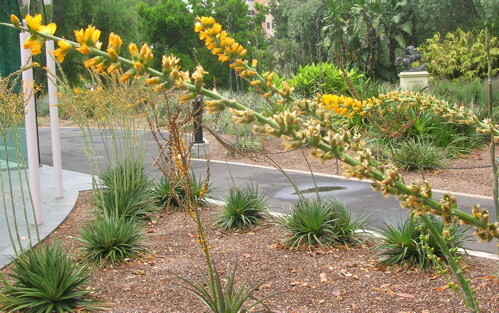 Some of these plants are common, others less so. They’re just a little taste of what I saw that does – or could – thrive in Portland. But seeing them thrive in a no- or minimally-watered Adelaide garden reassures us of their drought tolerance, at the very least. It’s good to have that sort of information available, given the latest reports on global warming.